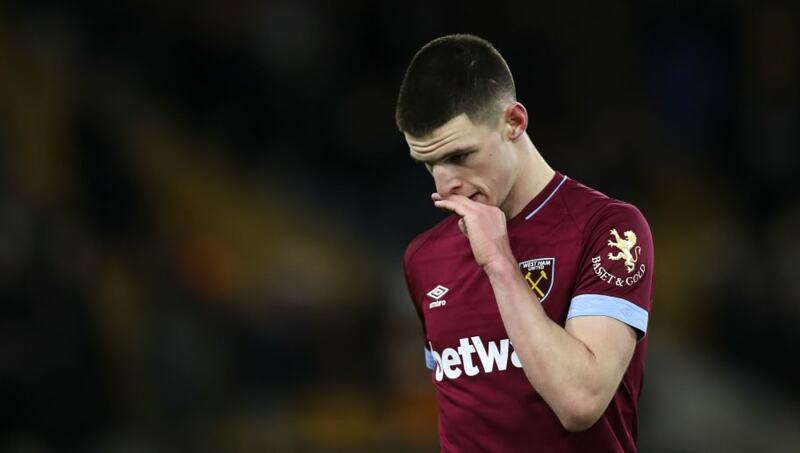 West Ham United fans have been taking to social media to express their thoughts on reports linking midfielder Declan Rice to Manchester City in the summer transfer window. The 20-year-old has been in excellent form this season for the Hammers, establishing himself as a regular under manager Manuel Pellegrini having played all but four of their fixtures this season in all competitions. Demonstrating a maturity on the ball beyond his years, Rice has produced a number of stand-out performances for his side which has attracted interest from ​Manchester City manager Pep Guardiola in recent weeks. According to ​reports, the midfielder is one of the Citizens main targets and could be subject of a £70m bid in the summer as the reigning Premier League champions look to add more homegrown talent to their squad. Lined up specifically as a long-term replacement for Fernandinho who at the age of 34 is nearing the end of his career, Rice may be the latest in a long-line of ​West Ham youth academy products to leave the club, following in the footsteps of Frank Lampard and Joe Cole. With rumours swirling around the youngster's future, the club's supporters have understandably had their say on the possibility of him leaving just three years after breaking into the senior side. Lol will be more than that. No way West Ham would let him go for a paltry £70m. Sadly the reality is if #mcfc or anyone else others that sort of money for Rice in the summer he will be sold. Our owners won’t turn down that sort of money. I was hoping we’d keep him for one more season, but there’s a chance he’ll be gone this summer. Just the way it is. Almost every club is a selling club. If a player's ability is above the level of the club (which is where Rice is heading) then at some point that player will leave. It's just the nature of modern football. The days of Brooking staying despite relegation are long gone. As soon as he signed for England I knew this would happen. Let’s stop being a feeder club realistically it won’t happen unless we sell our souls even more than we have already. Rice, who recently switched his national team affiliation from the Republic of Ireland to England, is expected to feature for the Irons when they face​ Fulham tomorrow night in the Premier League at the London Stadium. A victory for West Ham would extend their unbeaten run to three games and see them move above ​Everton in the league standings to ninth position.